When we were kids my Dad used to grow rhubarb in his vegetable garden. He’d usually tend to the garden on the weekend, and would often proudly bring in a freshly cut bunch of rhubarb and announce he had a bargain to make with me. The bargain generally went, if he stewed the rhubarb, I would make it into a rhubarb and apple pie. I think he knew that I loved cooking even way back then, as it was a bargain I’d always happily make. Besides, it meant we all got to eat rhubarb pie for dessert! Back in those days Dad used to cook up the rhubarb with a couple of spoonfuls of brown sugar, as that was just the way it was done. Rhubarb has a naturally tart flavour, so the addition of sugar made a delicious sweet and sour combination which lent itself perfectly to a sweet rhubarb pie. However, you don’t necessarily have to cook with rhubarb with a heap of sugar in order for it to taste good. Because rhubarb is mainly used for desserts it’s often mistaken to be a fruit. However, it is in fact a perennial vegetable which is quite easy to grow. It comes in both red and green varieties, so if you see green stalks in the store it’s likely they’re the green variety rather than being picked too early. 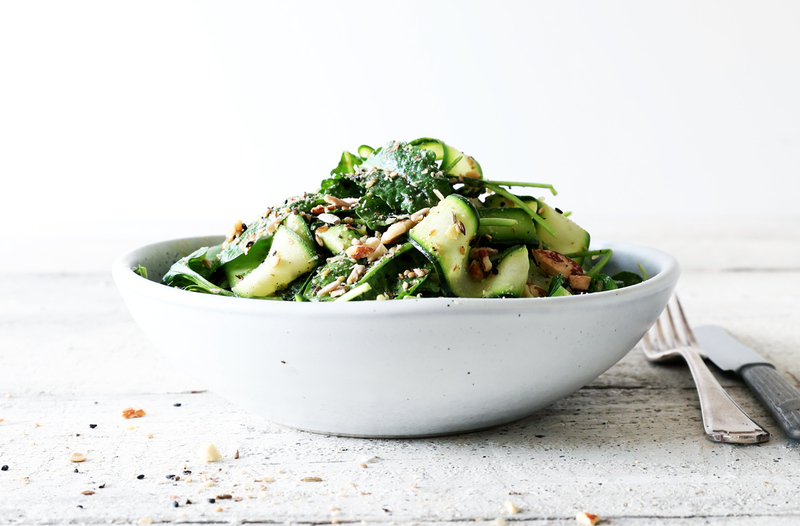 Rhubarb contains very little natural sugars so it’s a great choice for anyone on a low carb or sugar free diet, provided you don’t laden it up with sugar while cooking! 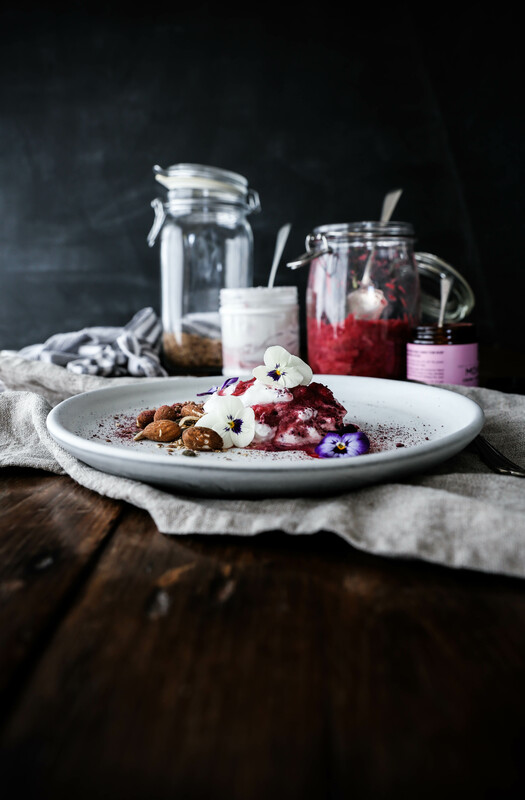 Contrary to tradition, unsweetened rhubarb is quite delicious, especially when combined with something naturally sweet and creamy like unsweetened coconut yoghurt. Which brings me to this recipe for softly stewed vanilla ginger rhubarb. It contains absolutely no added sugar (or sweetener), and while you may not want to eat it by the bowlful on it’s own, it’s truly delicious when added to your favourite breakfast cereal or yoghurt. 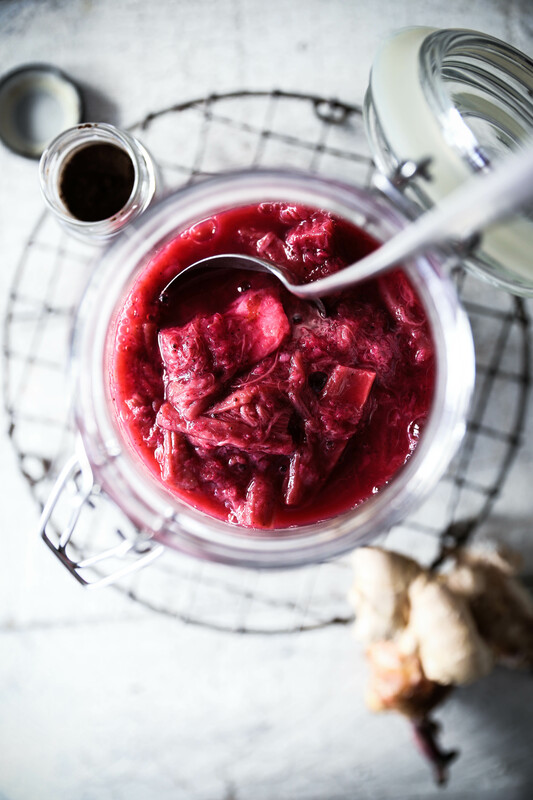 Of course, if you make this softly stewed rhubarb recipe and decide it’s far too tart for your liking, feel free to add a little sweetener of your choice. 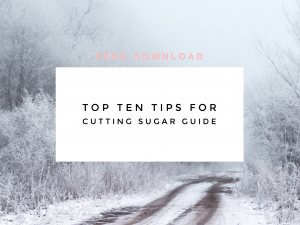 To keep it sugar free you could use a little stevia, for a low fructose option you could use either rice syrup or coconut nectar, or if you’re a honey fan, a little raw honey would combine beautifully with the ginger and vanilla. 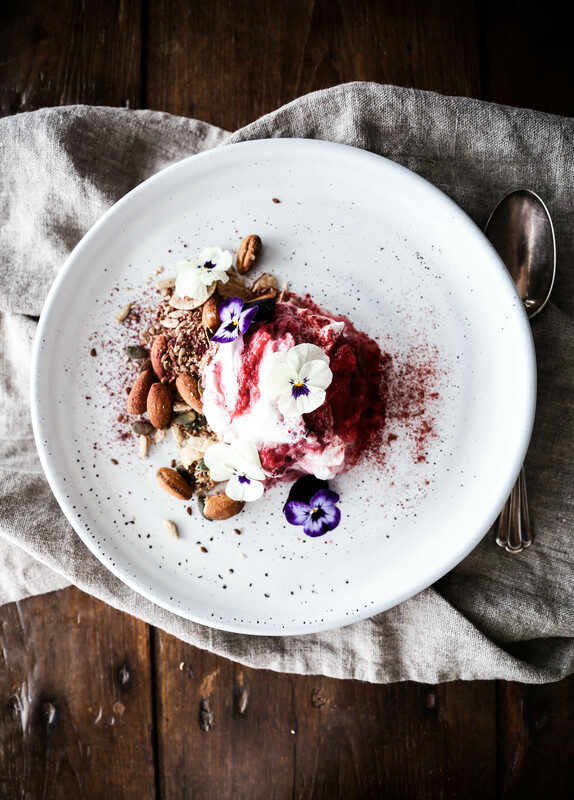 Below is an example of how I usually like to eat this spiced rhubarb compote: piled onto a plate with my activated coconut and blackcurrant granola, unsweetened coconut yoghurt, a sprinkling of one of Misty Day’s plant potions and edible flowers. But the possibilities really are endless. 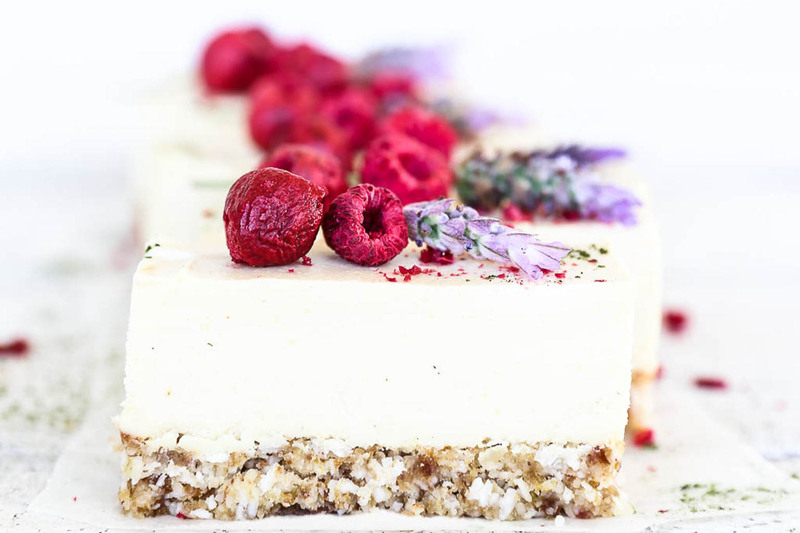 You could add it to smoothie, stir it through coconut yoghurt to create a mousse-like dessert, use as a topping on pancakes or even savoury fritters! Enjoy. tell in the comments below what your favourite way to eat it is! Wash the rhubarb well and chop into pieces approximately 3cm long, or as desired. Place in a saucepan with remaining ingredients over medium heat and bring to the boil. As soon as the mixture is boiling turn it down to a simmer and cook for 5 minutes, or until the rhubarb pieces are cooked through but still hold their shape. Turn off the heat and leave to cool. 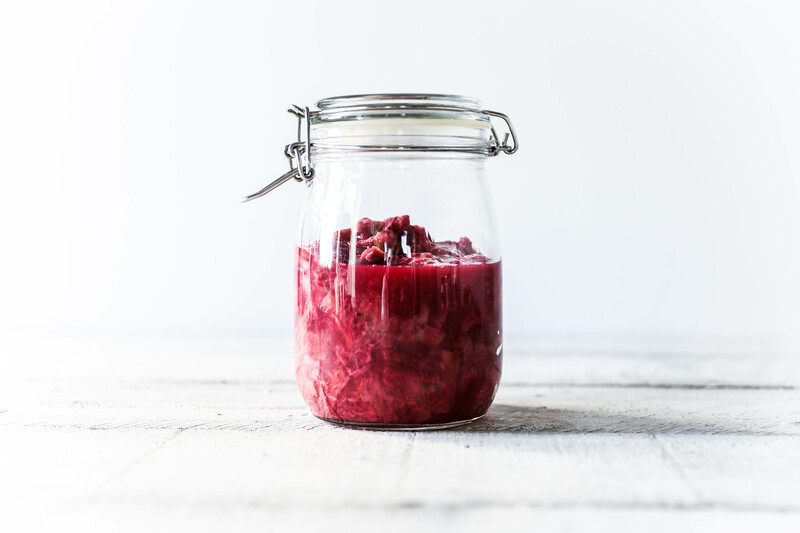 Transfer the poached rhubarb mixture to a glass jar (or storage container of your choice) and place in the fridge to chill. 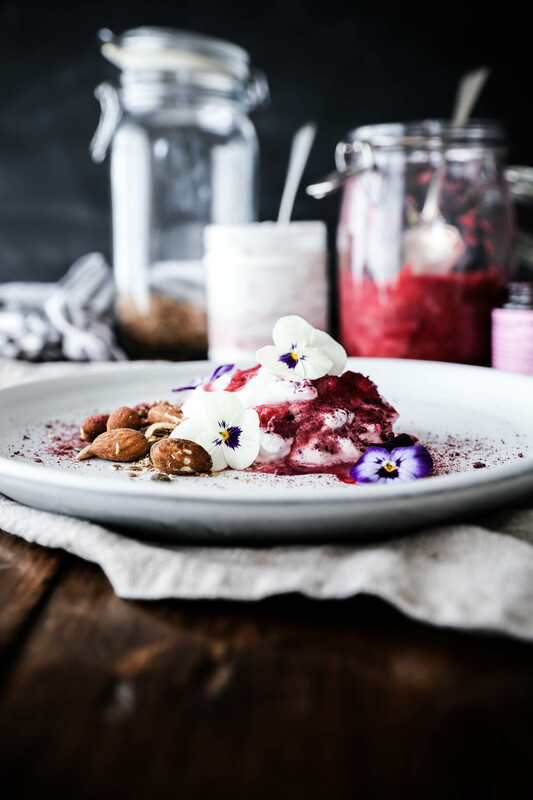 To serve, spoon the rhubarb into a bowl, top with coconut yoghurt, granola, tonic herb powders or anything that takes your fancy! To make rhubarb yoghurt, simply fold a couple of spoonfuls of the poached rhubarb through plain coconut yogurt. This softly poached vanilla ginger rhubarb will keep up to 5 days in a sealed container in the fridge, or 2 months in the freezer. Hello! I’ve just discovered your blog and I must say, it’s marvelous! 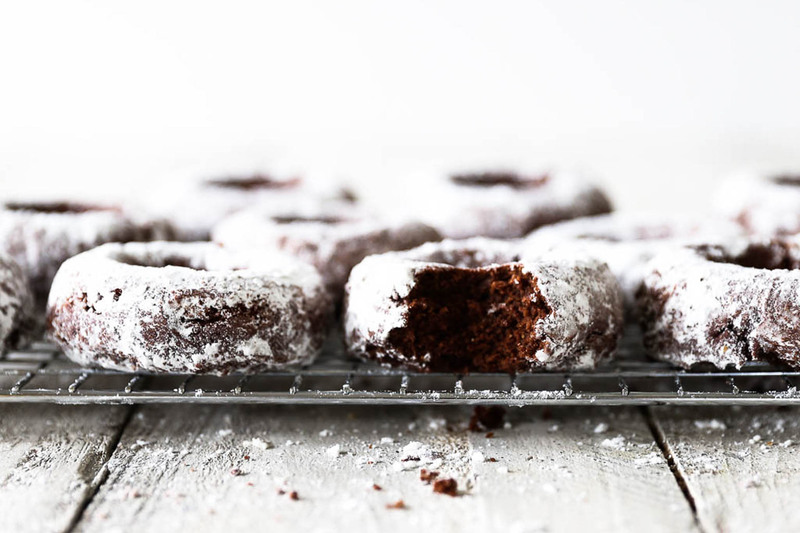 Your recipes are very inspiring and your pictures are simply mouth-watering!